Indoor air quality (IAQ) has increasingly become an integral component of sustainable building design as more is learned about indoor pollutants and the effect they have on building occupants. The U.S. Environmental Protection Agency (EPA) reports that the average American spends more than 90 percent of his or her time indoors, and recent EPA studies have shown that air pollution levels can be up to 100 times higher indoors than those outdoors1. In addition, poor IAQ has been known to either cause or aggravate 50 percent of all respiratory illnesses, according to the American College of Allergy, Asthma & Immunology. Fortunately, poor IAQ and the health problems that come with it are avoidable. Learning the causes of poor IAQ and the ventilation and wall assembly design strategies for eradicating various interior air pollutants can help building and design professionals create more sustainable, healthier interior environments for building occupants. The two leading causes of poor IAQ are mold growth and volatile organic compounds (VOCs). Mold can form and grow on any surface that provides a food source and is surrounded by moderate temperatures, oxygen and sufficient moisture. The best examples of mold food sources are cellulose-based substances. In today’s buildings, food sources for mold are readily available in the form of untreated paper-faced gypsum board, wood wall studs and wood-based sheathings. Once moisture is introduced to the mold food source, long-dormant mold spores can gain a foothold. As long as the food and moisture sources are supplied, the mold colonies will continue to grow and prosper. When mold has spread throughout a building, occupants may notice unpleasant odors and experience a variety of health problems, such as headaches, breathing difficulties, skin irritation, allergic reactions and aggravation of asthma symptoms. VOCs are gases or vapors, such as formaldehyde, given off by solids and liquids. VOCs often cause short- and long-term adverse health effects. There are several different sources of VOC emissions, such as paints and lacquers, paint strippers, building materials, furnishings, cleaning supplies and pesticides. of these items somehow incorporate organic chemicals into their manufacturing processes, though many manufacturers are now working to minimize the levels of these chemicals. All products manufactured with organic chemicals have potential for releasing VOCs while in use. IAQ first became a national problem after the energy crisis of the 1970s inspired the design of airtight buildings to prevent the leakage of conditioned interior air. Though tight construction seals off the escape of conditioned air, it also traps harmful water vapor and VOCs inside the structure. The best way to fix this problem is to design adequately ventilated buildings with an effective moisture management strategy in the wall assembly based on the use of innovative new building products developed for mold resistance and VOC reduction. The most concise guidelines on the topic of IAQ improvement are found in American Society of Heating, Refrigerating and Air-Conditioning Engineers (ASHRAE) Standard 62, Ventilation for Acceptable Indoor Air Quality. ASHRAE Standard 62 spells out minimum ventilation rates for new construction, as well as information on improving IAQ in existing buildings. It also lists maximum levels of contaminants that can be present while still maintaining acceptable IAQ; keeping these levels below the maximum minimizes the potential for adverse health effects among building occupants. ASHRAE Standard 62 covers air classification and recirculation, the evaluation of contaminant concentration, sensory-irritation intensity and odor offensiveness. There are four air quality classifications: 1, 2 and 3 for low, moderate, and significant levels of contaminants, and 4, for highly objectionable or harmful air quality. Air streams — air that flows through exhaust ducts — are classified separately. Exhaust from parking garages is a good example of an air stream that presents IAQ problems. In this article, we will focus on improving IAQ through moisture management and VOC-reducing strategies in wall assemblies. When fortifying a building’s defense against moisture intrusion, choosing the proper wall materials is a good place to start. The most common wall assembly for commercial and public buildings is the steel stud cavity, which would typically include a masonry facade. Here are some guidelines on the contents of a steel stud cavity assembly: First, always use a water-resistive barrier (WRB) — it’s the first line of defense against rainwater intrusion. Water will enter somewhere, somehow, so use a ventilation and drainage space between the masonry façade and the WRB. It is important to maximize condensation control several ways — first, by using insulating sheathings. Use exterior air/wind barriers, since air can transport considerable moisture into assemblies if not blocked. Use interior air barriers to help prevent wintertime moisture from migrating and condensing on cold surfaces. Next, include fiber glass insulation and a smart vapor retarder to not only control the wintertime moisture but also allow assemblies to dry during other seasons. And in areas of the building that are moisture-prone, it is a good idea to install moisture-resistant treated gypsum board at the interior walls instead of standard paper-faced gypsum board. When exposed to moisture, fiber glass insulation neither absorbs nor holds water. 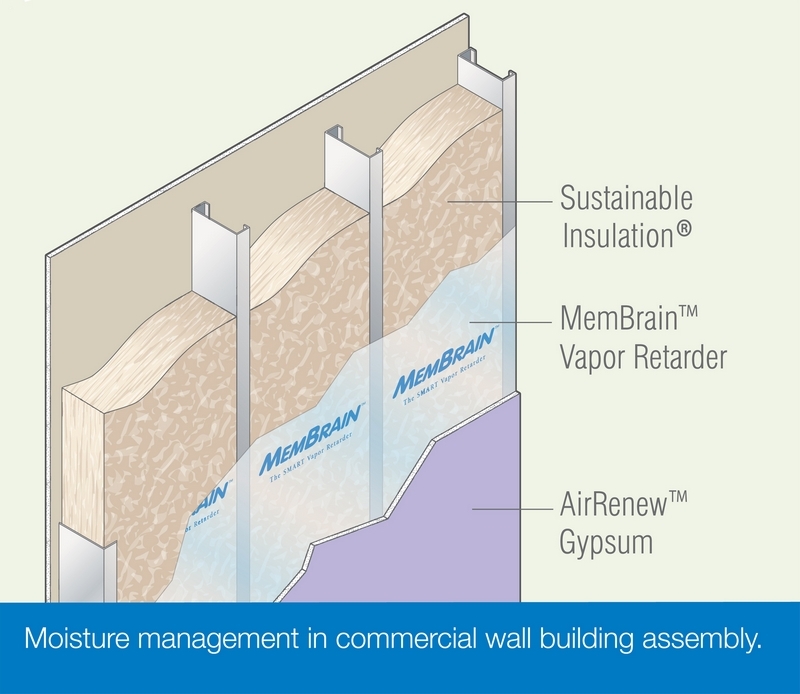 It is also resistant to mold and microbial growth, making it an excellent insulation choice in moisture-managing wall assembly designs. 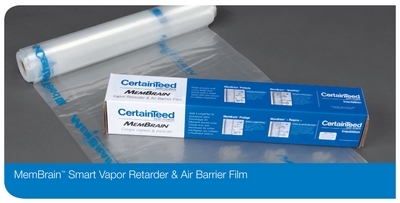 Originally developed, tested and commercialized in Europe, smart vapor retarders resemble polyethylene film, but are actually polyamide, a nylon-based material. Polyamide film retards moisture under dry conditions, but if relative humidity in the wall cavity increases above 60 percent, they dramatically open up to a much higher permeance, which allows drying toward the interior of the building. 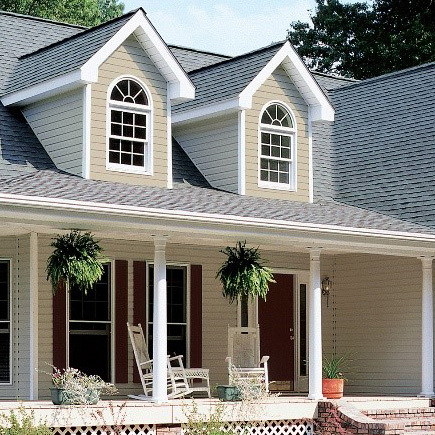 In summer, when the air is humid, the moisture penetrates through the pores into the building interior, allowing building materials to dry out. If the relative humidity decreases, the pores close up again, and the membrane then acts as a retarder to moisture. In the winter, this vapor retarder protects the building materials behind the membrane from condensation. Field tests have proven that smart vapor retarders effectively reduce the risk of moisture damage in the building envelope by increasing the construction’s tolerance to moisture load. Traditional gypsum board is paper-faced and therefore a potential mold food source under moisture-heavy conditions. An explosion of mold litigation cases across the United States over the past 10 years provided the gypsum industry with an opportunity to assist in solving a growing public concern by concentrating its research programs on developing new moisture- and mold-resistant products. Today, gypsum board manufacturers offer many enhanced versions of non-fire-rated and fire-rated Type X gypsum board panels with enhanced moisture and mold resistance. 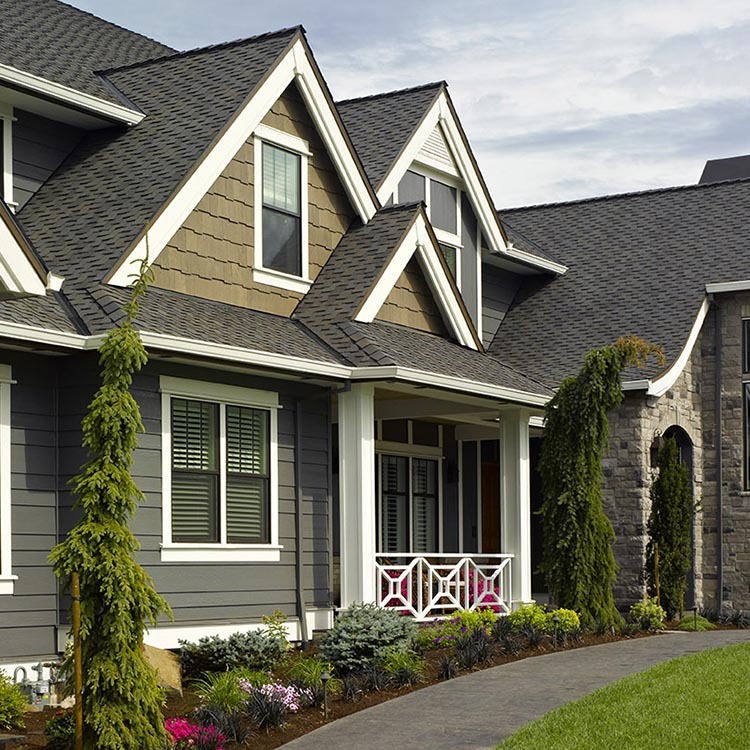 Most common are paper-faced gypsum boards treated with bio inhibitors, products that prevent the growth of mold whenever moisture is introduced to the facing. Some manufacturers also now offer paperless gypsum board, with fiber glass mats in place of paper facings. The technology used to develop paperless gypsum board is similar to the technology used in manufacturing performance-proven moisture-resistant gypsum exterior sheathing products. 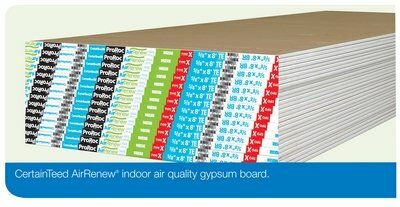 Both paper-faced and paperless treated gypsum boards with moisture-resistant cores have the highest mold resistance ratings of 10, as defined in ASTM D3273, Standard Test Method for Resistance to Growth of Mold on the Surface of Interior Coatings in an Environmental Chamber, the industry standard for mold resistance. Paperless glass mat gypsum boards are more expensive than treated paper-faced gypsum boards due to the higher cost of glass mat materials. Since there is no limit to where mold spores can travel, it is wise to specify moisture- and mold-resistant gypsum board in all high-humidity climates and for any areas of a building that will likely have high moisture levels, including kitchens, showers, washrooms, locker rooms, basements, laboratories, laundry rooms and any area that will occasionally be exposed to splashes of water. To keep VOC levels at a minimum, it is important for building maintenance staff to use only low-VOC cleaning supplies, pesticides and air fresheners and for building and design professionals to specify low-VOC finishes and building products. Most manufactures have worked hard in recent years to reduce the VOC emissions of their products to very low levels. However, it is still important to check individual product data to be certain. Certification from the GREENGUARD® Environmental Institute is one resource for determining if a product’s VOC levels are within acceptable limits. One of the most recent innovations for reducing the VOC content of interior air involves extracting VOCs from the air and neutralizing them within the walls. CertainTeed Gypsum recently introduced AirRenew®, a gypsum board product that captures VOCs — especially formaldehydes and other aldehydes — as they circulate through interior air and converts them into inert compounds that remain trapped within the gypsum board. 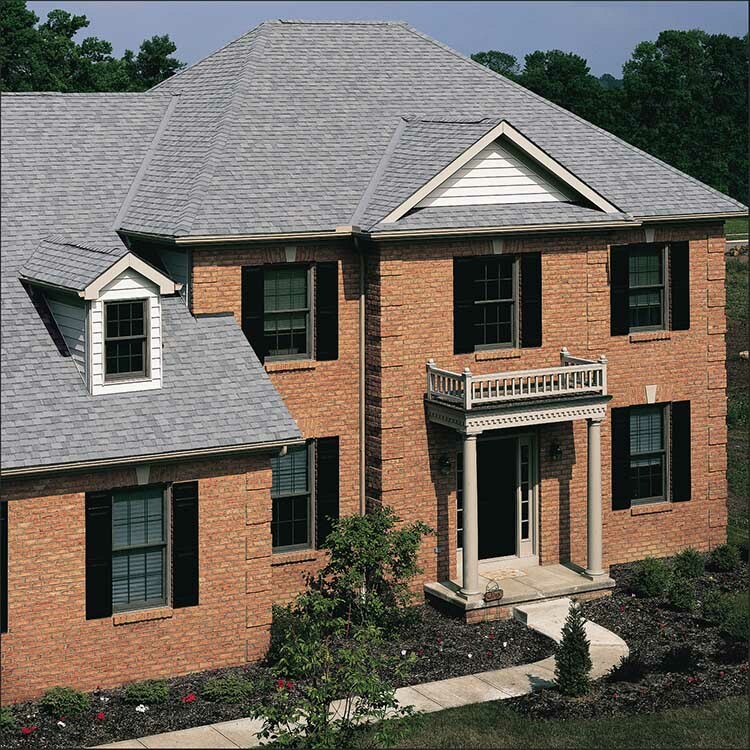 The product also incorporates patented technology to provide enhanced moisture and mold resistance. AirRenew will continue to absorb VOCs for up to 75 years based on typical indoor formaldehyde concentrations and air flow rate. It works with most breathable wallpaper and water-based acrylic paints, even after multiple coats. It can be recycled the same as regular gypsum board, and sent to landfill without polluting ground water. CertainTeed has conducted laboratory studies on the product using the ISO16000-23 method, an indoor air performance test for evaluating the reduction of formaldehyde concentration by absorptive building materials. The 28-day test showed that the product permanently eliminates formaldehyde. Wall assemblies that feature VOC-reducing, low-VOC, mold- and moisture-resistant gypsum board in concert with low-VOC fiber glass insulation and properly placed vapor retarders are one of the strongest defenses available against poor IAQ. Indoor air pollution caused by VOCs and mold growth is a significant threat to the health of building occupants and an obstacle standing in the way of sustainability in a building. Following the guidelines above will help to create a drier, mold-free interior environment, which in turn will result in higher-quality interior air. If maintained, high IAQ creates a healthy and comfortable interior environment for building occupants that will last for many years. Being proactive during the design phase of new construction or taking steps to improve the IAQ of an existing facility are actions that truly benefit all parties involved. 1 "The Inside Story: A Guide to Indoor Air Quality." U.S. EPA/Office of Air and Radiation. Office of Radiation and Indoor Air (6607J), Cosponsored with the Consumer Product Safety Commission, EPA 402-K-93-007.